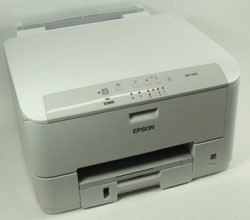 Trusted Reviews has tested a color inkjet printer from Epson called Epson Workforce Pro WP-4014DN. Epson claims that this printer is able to print up to 26 pages per minute. Let us hear what the reviewer thinks about this model. Trusted Reviews ends up giving the Workforce Pro WP-4014DN a very good review with an overall score of 9 out of 10 possible points and even a “Trusted Reviews Recommended” award. The Epson printer scores highest on print speeds and value for your money where it gets a perfect score, a little lower on print quality and lowest on features. The reviewer finds several aspects that he enjoys with this inkjet printer including up to laser print speeds and good quality on photo prints. There is a couple of points hindering the Epson from getting 10 out of 10 and they are that the printer is missing wireless connectivity and it is a bit noisy. Read the full review of the Epson Workforce Pro WP-4014DN color inkjet printer here.